Jubilate is our children's choir. It is open to all children between 6 and 11 who enjoy singing and there are no auditions. We rehearse for about 20 minutes on Sunday morning after the 10.00am service, whilst the parents are having their morning coffee. We are always looking for new singers, particularly boys. 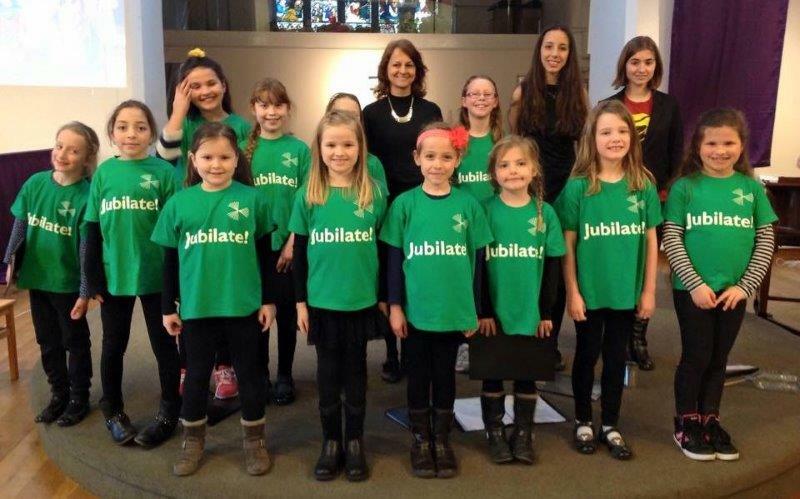 Jubilate regularly performs at major services and festivals, as well as putting on bigger productions. Performances have included ‘Jonah Man Jazz’, ‘Resurrection Rock’, and fully-staged productions of ‘From Pharaoh to Freedom’, 'Planet Plenty', 'Giant Slayer', the story of David and Goliath, and 'Noah…with a Twist'! written by an older member of the choir, Lottie Fallis. In 2013 the children performed Lottie's new musical 'Believe', a morality tale about a selfish pop star, with the proceeds going to Faith in Action homeless drop-in centre. Jubilate's tenth birthday in 2015 was marked by a concert featuring favourite songs from our performances over the last decade. Future plans for music-making by young people include the re-formation of an instrumental group, so please keep an eye on the website for details. We have a lot of fun in rehearsals as well making an important contribution to the worship at Holy Trinity through music-making. Music is a great way of working together and we have seen the youngest members of Jubilate grow in confidence and musical ability, now with the possibility of joining a senior choir once they reach secondary school age. Do contact Tracy Lees if you would like to join in music making with our young people's choirs.